Fairhaven Micro Alti Vario Review - More than just an altimeter! I bought my Fairhaven micro alti vario plus nearly 4 years ago, and it's been fantastic. I couldn't find a review online, so it's only right that I give this cool little gadget a full run through and tell you what it can do. So what is the Fairhaven micro alti vario? well as the name alti vario suggests, it's made mainly as an altimeter and a variometer. But the micro alti has a lot more to offer, and we'll look at all of its features below. Before we take a look at what it's capable of, you can check the current price of the micro alti on Amazon by clicking here > MicroAltiPlus. Who is the Fairhaven Micro Alti for? The micro alti is used by pilots of any light aircraft that lack cockpit instruments. The variometer feature makes it great for glider pilots, as does the thermal finder. 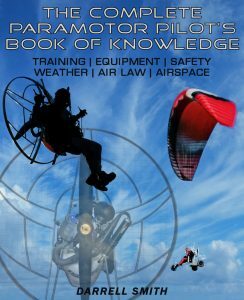 I've used it for both paramotoring and paragliding, and I know many hang gliding and powered hang gliding pilots that also find it very useful. It can be worn on your wrist just like a watch, or if you're paragliding or paramotoring, you may wish to connect it to one of your risers. This way you can keep your hands on the brakes, and just glance to the side to check your altitude. It also comes with a long velcro strap that will stretch around a coat, and velcro pads that you can stick to your gliders cockpit etc. If your aircraft is powered, you will likely buy the Fairhaven micro alti vario for its altimeter function. This is essential if you're flying in or near to any airspace, if you need to abide by the 500 foot rule, or if you fly at high altitude where the air is thinner. And although it can be essential, it's also fun to know what altitude you're flying at, and to test things like your climb rate. The altimeter seems very accurate, I've tested it against my friends Casio Pathfinder when we flew to over 4000 feet and they both read within a foot of one another. 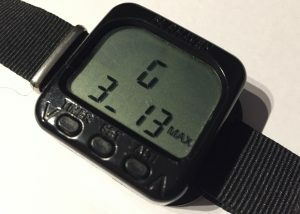 Obviously an altimeter watch like the Casio is another option if you don't need the vario option. It's something that will replace your everyday watch, whereas the alti vario would only be recommended for flight. If you would rather go for a watch the Pathfinder (link to Amazon) is also highly recommended. Option (screen) 1. The altimeter is zeroed at your launch field. Option (screen) 2. You set the elevation or actual height of your launch field. Option (screen) 3. This is the QNE function which displays your altitude relative to 1013.25mB or sea level. Pressing the alti button a fourth time will also reveal a barometer which displays the air pressure. The barometer can also be zeroed so you can keep an eye on the slightest weather changes before you go flying. This is really useful for paragliding when you're waiting for that small weather window to open up. 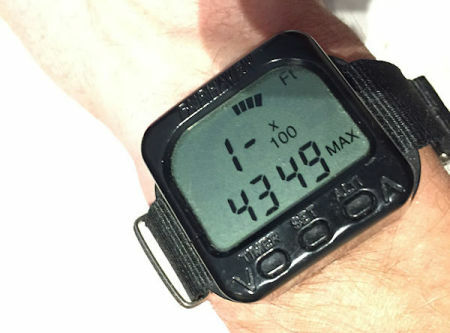 Many pilots will buy an altimeter separate to their vario, simply because they don't always use the vario, or the constant noise annoys them when it's not needed. Fairhaven have thought about this and included a switch that has three positions. Position one displays the on screen vario, and also activates the audio tone. This is perfect for thermalling because you can listen to the tone without looking at the vario. If you're wearing ear defenders for paramotoring, you can also plug in headphones so that you can hear the vario, or you can use an external bleeper. You can use standard earphones as below, or you can plug in your headset, providing it has a 3.5mm (1/8 inch) jack plug. As you listen to the vario, you'll here 3 different distinct tones. One tone indicates sink, another indicates rising air, and the last tone indicates lift; this is what Fairhaven are calling the thermal finder. This feature detects when your sink rate is improving, even when you're not ascending. If you'd rather not here the tone, but you still wish to see the on screen display, you can push the switch to the centre to silence the micro alti. Pushing the switch to the top stops the tone, and removes the on screen vario display, perfect for times when you just need the altimeter. This could also be useful for hiking or climbing! The vario is very sensitive, and just a 6 inch movement is enough to activate the tone, and to see a blip on the screen. The tone is also very good, and you shouldn't have any problems hearing it while paragliding or hang gliding. If you're wearing headphones, the tone may be too loud, but not to worry as you can adjust the volume! What else can the micro alti plus do? A feature that I love playing with is the G-meter. Lock your glider into some steep turns, and immediately see how many G's you're pulling. You can watch the G-meter as you manoeuvre, or you can wait until you land to scan through the menu to find your maximum G. Be careful when pushing yourself though, many pilots have blacked out because of G-LOC! The micro alti can replace your normal watch as you fly, and gives you the time, an alarm clock, and a stopwatch. 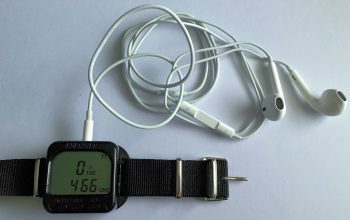 This is great for timing your flights, or for a fuel tank timer. What I find really handy is the auto timer function. When flying paramotors without a fuel gauge, it's important to know how long we've been in the air, so that we don't run our fuel tanks dry. The micro alti automatically detects a small change in altitude and starts timing, so even if you forget to start the timer it's always counting your flight time. I've already mentioned that the G-meter remembers your maximum G. The micro alti also remembers important things like your maximum altitude, and your maximum sink and lift. Sometimes you can get carried away when your flying, and your mind is on so many different things that you may forget to check. So this is really handy for looking back at your flight. I told you earlier that I've had my micro alti plus for over 4 years, can you believe that the battery is still perfect! I don't always fly with the micro alti, when I do it's usually on long cross country flights during the summer. This means the micro alti may be sat all winter without use. But after the winter I can turn it on and the battery is still fully charged and ready to go. The battery is built-in, and you simply plug it into a USB port to recharge it. This could be the port on your computer, a phone charging socket, or a solar charger. Fairhaven also include an in-car charger that plugs into your cars cigarette lighter socket. At just 28 grams, the micro alti plus is very light, and you won't even notice you're wearing it. It's pretty small at 37 mm square, but the screen is still big enough to easily see the high contrast custom LCD display. Would I buy another micro alti plus? The Fairhaven micro alti plus is very robust, and I can't see it breaking anytime soon. But if I needed another one, would I buy one again? Well I think you've probably already guessed that I really like it, so that's a yes! I've never been a massive fan of wearing watches, I always find them annoying, but the micro alti is so light that I sometimes forget I'm even wearing it. 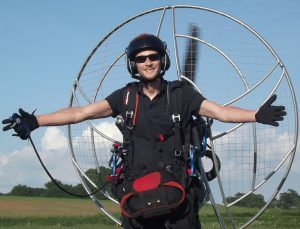 I like that it's comfortable, and at the same time it does everything I need a paramotoring instrument to do. I was a bit worried when I discovered that the battery was built in, I didn't expect it to last long, but 4 years later and it's still going strong! It's also very durable! I've thrown it into my kit box amongst tools, and other paramotoring bits and bobs, and it hasn't been damaged, and there's not a scratch on the screen or casing (as you can see by the pictures). Overall I think this is a great product for any pilot that requires a reasonably priced, lightweight altimeter, or vario. I've never had a problem seeing the display while flying, but if you wanted to use the micro alti for other things, like hiking, you may wish to see the screen at night. There is no back light, so this may not be great for night use. The strap is OK, but nylon webbing isn't very pretty. It could be replaced if it really bothered you though. Check out the Fairhaven micro alti plus on Amazon here > MicroAltiPlus. You can find more great paramotoring accessories in my recommended gear section HERE. Or check out more helpful articles HERE.